For Team Ballard and Team Cotter, representing BC at the 2018 Canadian U18 Curling Championship was an experience they are not likely to forget. Both teams qualified for the Canadian U18 Championship by winning the 2018 Optimist BC U18 Curling Championship this past March. The Canadian U18 Championship is for athletes ages 17 and under (as of June 30, 2017), and this year it took place in St. Andrews, New Brunswick from April 9 to 14. While the results were maybe not what they were hoping for, competing at the Canadian U18 Championship was a great way for the BC boys’ team, Team Ballard, to prepare for the 2019 Canada Winter Games, which they qualified for earlier this month. Skip Dawson Ballard’s team of third Hayato Sato, second Joshua Miki and lead Troy Chong of the Royal City and Coquitlam Curling Clubs finished fifth in Pool B with one win and four losses in round robin play. The team was led by coach Bryan Miki, who was a member of Greg McAulay’s 2000 World Championship team. As Team Ballard did not progress to the Championship Round, they spent the last few days of the Canadian U18 Championship taking part in a mixed doubles competition, in which athletes from different provinces were matched together to form teams. Chong, together with PEI’s Lauren Ferguson, claimed silver in the mixed doubles competition. Miki received the Boys Coach Fair Play Award (voted on by the umpires) and the Boys Coach Sportsmanship Award (voted on by players and coaches). Chong was the Boys Pool B Sportsmanship Award winner. Representing BC in the girls’ tournament, skip Jaelyn Cotter, third Kaila Buchy, second Katelyn McGillivray and lead Cassidy Schwaerzle of Vernon Curling Club advanced to the Championship Double Knockout Round after finishing fourth in Pool A with three wins and three losses. Led by coach Jim Cotter, a seven-time Tim Hortons Brier participant, the BC girls started off the Championship Round with a stunning victory over Alberta, who had finished first in Pool B with five wins and one loss. Alberta took a 7-0 lead in the first two ends, but Team Cotter gradually battled back, starting with two points in the third. Alberta got a single point in the fourth end to make the game 8-2 before BC scored deuces in the fifth and the sixth and singles in the seventh and the eighth to tie the game 8-8 and take it to an extra end. BC ended up scoring two points in the ninth end to win the game 10-8. 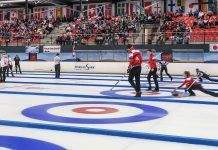 Team Cotter later lost 8-4 to both Saskatchewan and eventual champions Nova Scotia and did not progress to the semifinals, but still found their experience competing on the national stage a valuable and exciting one.